This gentleman, decorated and in uniform, was in the group that led the Carolina Day parade in Charleston – the Washington Light Infantry (1807), membership is made up of veterans. We on the Ridge don’t always know what the Low-Country is doing. 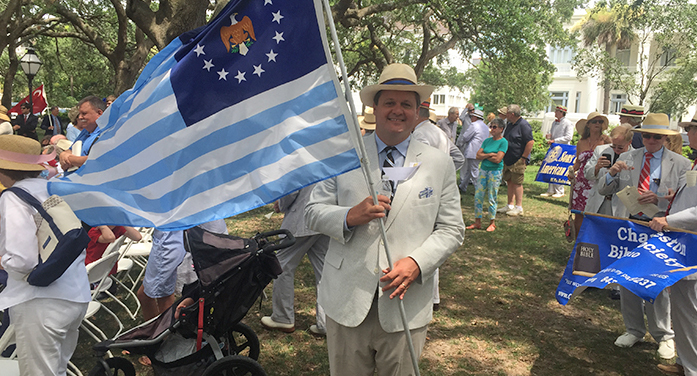 Few probably are aware that there has been a tradition in Charleston, the bedrock of much of the early S.C. history, that on June 28 there is a celebration each year – Carolina Day. It basically is celebrating the Revolutionary battle victory when Gen. Moultrie’s forces (numbering few in comparison to the enemy) won over the English. The Red Coats drowned in the undertow, or were taken away by the Patriot’s marksmanship. As they tried to gain access to Sullivan’s Island (where Fort Moultrie is), they lost to the SC forces and insured the call for a Declaration of Independence. When those gathered in Philadelphia heard of the victory in Charleston, it is said there was more resolve in signing that important document. Charleston, for a hundred years after, gave public celebration to a feat that gave energy to the drive toward Independence. Not allowing the celebration to be completely lost, in the last decades or so, some 55 local societies (listed at end of this article) have gathered to rejuvenate the celebration. This June 28 event is like a prelude to our Independence Day of July 4. The celebration in Charleston started with a church service at 10:00 a.m. at St. Michaels Anglican Church. A parade involving these 55 societies, showing dates covering from the St. Andrew’s Society of Charleston of1729 to Children of American Revolution, Long Bay Chapter, 2004, carried flags and marched from Washington Square on Broad down Meeting Street to White Point Gardens (The Battery). 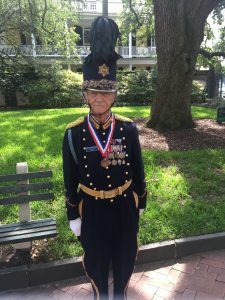 Chairman of the Palmetto Society, Charles Waring III, officiated at the program that followed the parade. The gathering heard from Mayor Techlenberg. His address was full of patriotic fervor, mentioning his own ancestor, one of the signers of the Declaration. It was stated above that, unawares of the tide at Sullivans, the British marched their soldiers into the sea. Another mishap for the enemy was that the cannons shot from English ships were deflected by the Palmetto trees whose trunks made up the Fort Moultrie walls and were soft and yielding, so the impact of the cannon balls was lessened. It was a victory for Fort Moultrie and gave energy to the call for Independence, now one of the greatest of celebrations in our country today. A member of the Advertiser family, Butler Derrick III, shared the story with this newspaper and is pictured holding the Society of Cincinnati (named for the Roman Gen. Cincinnatus) flag. He marched as a member of the Society (1783).